Tail Drop is when the packets are dropped when they arrive on a congested interface.Tail Drop is not just bad for voice packets but for data packets as well. It also impacts the efficiency of network bandwidth utilization. When the Output Queue is full and packets arrive in on the Input Queue, then the packets which are arriving on the interface will be dropped. It does not matter if its a voice packet or a data packet, everything will be dropped by default when Tail Drop is in action. TCP has a mechanism where it can identify the packet loss and send those packets again. TCP Senders will start sending packets, and they will increase the rate at which they send packets when there is no congestion and no packet loss. The increase is exponential over a time interval. 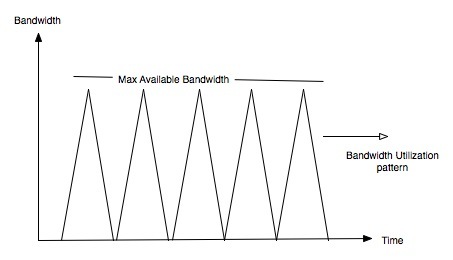 When packets are being dropped, they sense that network is congested and then TCP Slow start kicks in, the sending rate is suddenly dropped by a big margin until there is no more packet loss and again the sending rate picks up slowly after certain time interval where TCP does not see any packet loss. When TCP Slow Start kicks in, all senders on the network back off and you can see a drop in the bandwidth, then slowly everyone starts sending packets at higher rate as they see no more packet loss, so all senders on the network start sending the packets again at higher rate and you see peaks in the network bandwidth. At this time the interfaces can get congested again and packets can be dropped, which then makes all senders to drop their sending rate and wait for certain time interval where they see no more packet loss, this leads TCP Senders to again increase the sending rate. This goes on in cycles and this behavior means a lot of bandwidth is just getting wasted. If you are monitoring the bandwidth with a graph, you will something like below graph in the utilization charts. This behavior is also called as “Global TCP Synchronization” and it is responsible for a lot of network bandwidth wastage. Congestion avoidance techniques basically monitor the network traffic and analyze the bandwidth loads, then they anticipate and avoid congestion at common network bottle-necks by dropping packets in advance. With RED, the packets are discarded randomly before the Queue gets full, and increase the random drop rate when the queue is getting full. With RED implementation the problem of global TCP Synchronization can be effectively avoided. Is the point where the average queue hits or goes over this threshold value and random packet dropping starts. Is the point where tail drop behavior comes into action. Is the fraction of packets to be randomly dropped. That is how many packets to be dropped. WRED is Cisco implementation of RED. Cisco does not do the random dropping using RED algorithm, instead it used its own WRED. All WRED does is to make sure that important packet does not get dropped in the random dropping process, instead a not so important packet is dropped. With WRED multiple RED profiles are automatically created by the router based on IP Precedence or DSCP. If you decide that WRED is based on IPP then router will generate 8 different profiles for the dropping decision. If you decide to use DSCP then the router will create 64 different profiles for the dropping decision. 2. Maximum Threshold : Is the point where tail drop behavior comes into action. 3. Drop Probability: Determines how many packets to be dropped. All these three values are calculated for each of the profile – which is 8 profiles when IPP is used and 64profiles when DSCP is used. 1. EF will get a very high minimum threshold. 2. AF Classes get their minimum thresholds as per their Drop Priorities. These values can also be set manually. When CB-WRED is used in conjuction with CBWFQ, it allows DiffServ Assured Forwarding Per Hop Behavior. DSCP uses 6 bits of ToS Byte in IP header, and the last 2 bits are used for ECN. ECN marks the packets when the average queue length exceeds a specified value and the Routers and the end hosts can lower the sending rates based on ECN. But all routers and the end hosts in the network must support this feature to work. Exponential Weighting Constant is the value which determines the burst rate. You can control the WRED sensitivity to bursts. Lower Values of N – long bursts that is WRED will be more burst sensitive and can cause more packet loss. 1. If the value of n gets too low, WRED will overreact to temporary traffic bursts and drop traffic unnecessarily. 2. If the value of n gets too high, WRED will not react to congestion. Packets will be sent or dropped as if WRED were not in effect.